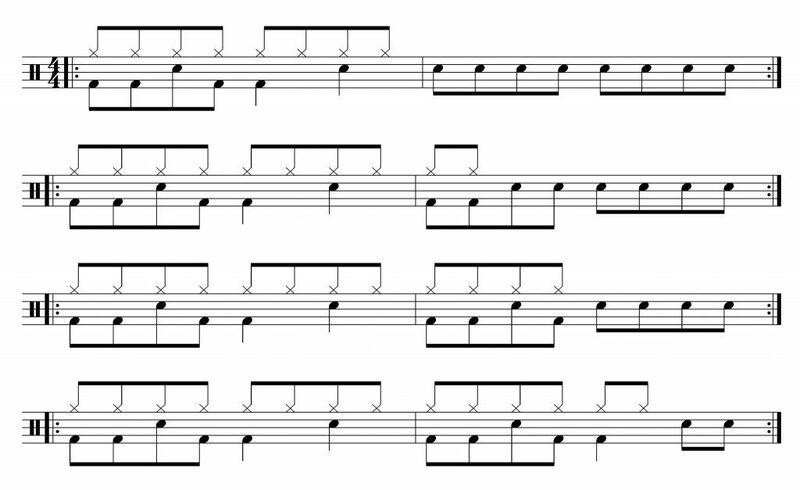 Let’s say your teacher has assigned you a page of drum beats to practice & you’re having some problems with them. You’re not sure if you’re playing them correctly, or they just don’t sound good. What can you do? Here’s some strategies to help you learn the beat, and some tips on practicing them so you can make them sound good and make them available to you when you’re jamming with your favourite songs or rocking out with your band. Method 1: Write & Count! Write the counting underneath the troublesome beat, then count out loud while playing the beat. I find that for a lot of students this is all they need to do to realize where they are going wrong & to be able to correct themselves. Counting out loud reinforces the connection between the limbs and the brain and makes it more obvious where you are going wrong. Let’s isolate the hi-hat part and play it and count out loud while doing it. Now drop out the bass drum and practice the hi-hat & snare drum. Keep the counting going! Our final combination is the bass drum & snare drum together. Are you still counting? Finally, try to combine it all together. I hope you’re still counting! This idea is quite simple – you just build the groove up one note at a time. I find this really helpful for more advanced beats. Play the first note – but be sure to count them all. Now add another – keep counting. Two notes are better than one. Add one more – still counting? Starting to feel the beat? Keep adding them one by one – here’s your next five steps. Count. You’ll be grooving in no time. Practice each step until you find it easy before moving onto the next one. Hopefully one of these steps will help you to learn the groove. If you’re still having trouble learning the beat, I suggest you message your teacher and ask them to send you a video or audio clip of them playing it. Sometimes you just need to hear it played correctly. Also you can just highlight the groove and be sure to ask your teacher about it on your next lesson. So hopefully you can play your beats now, but that is just the start of the journey. Now we need to really master the beat. Step 1: Play it a lot! The more you play a beat, the easier it will become to play. Once it becomes easy to play, then you can start to adjust it to make it sound better. Play each beat you learn for long periods of time. Find a song that you like and play your beats along with that song to make it more enjoyable. Practice your new beats every day & soon you’ll be playing them with ease and at higher tempos. Step 2: Make it sound better! Does the way you play a beat sound the same as the way your teacher or favourite drummer plays it? Probably not. What’s the difference? Normally these two things – dynamics and precision. Dynamics – how loud or soft is each individual voice you are playing? A lot of beginners playing rock/pop beats play the hi-hat too loud and the snare / bass drum not loud enough. Imagine each of your limbs has it’s own volume control and has 2 settings – loud and soft. Now play your groove with the hi-hat loud, and bass and snare soft. Now make the hi-hat & bass soft but the snare loud. Now lets drop the snare & hi-hat down low but bring the bass drum up loud. Now lets try the favourite, hi-hat soft, snare & bass loud. You can work other combinations. Getting dynamic control of your limbs will give you more control over each groove you play and will enable you to sculpt the sound of your beats. Precision – hitting two or more things together at exactly the same (and right) time requires more practice than you’d think. Think you’re playing all your notes perfectly in sync without any unintentional flams? Try recording yourself playing (you just need one mic – you can probably use your phone) and then open the audio file in something such as Pro-Tools Lite or Audacity and then use the zoom function to zoom in on the beat… Does the wave form look nice and clean? Can you hear the beat just from looking at the wave form? Do you see the hi-hat on beat 2 just before or after the snare? Or do you only see the snare because the hi-hat is perfectly aligned with it and is hidden by the snare? Are your 8th note hi-hats evenly spaced or do they look uneven? What about the bass & hi-hat… and if you play a four-on-the-floor disco groove, are your bass, snare and hats all hitting perfectly together? Playing things perfectly together at the perfect time is a critical skill for anyone who wants to be a recording drummer, but even if you don’t, it’ll just make your grooves sound cleaner and crisper. To practice this skill, you just need to slow way down (40bpm), concentrate on each beat and listen. Use a metronome. Record yourself doing it. I found that intently watching the stick hit the hi-hat helped me to get the bass and snare in sync with it. Once you can get everything together 100% of the time then you can start speeding up. Can you bury the metronome each time? You should find that a bit of time spent working on this with just one beat will impact all your other grooves too because it’ll become a habit. As you learn more styles and beats, record them too and see if they create any issues with precision. If you can record directly to something like Audacity while you’re practicing, then you’ll be able to get real time feedback while you’re playing and make adjustments more easily. I use a zoom microphone (I’ve got the H1, H4n, and H6 – they are all great) together with Audacity to help me work on this. Once you have mastered the groove with simple fills, then you can move on to more complex fill ideas and try starting on the offbeats as well. Hopefully this blog post has helped you to overcome problems in learning grooves and given you some idea on what to work on when practicing your grooves. If you’re in Singapore and would like a free trial lesson with one of our teachers then please fill in the contact form on the contact us page.